I came across Check Your Credit Score For Free post on All Financial Matters Blog today, which shared a tool that will estimate your credit score for free. The tool was good, but I found a better one called myFICO FICO Score Estimator (it’s faster and there’s no advertisement). The calculator asks you 10 questions to come up with an estimated range of your FICO credit score. How long ago did you get your first loan? How many loans or credit cards have you applied for in the last year? How recently have you opened a new loan or credit card? Besides any mortgage loans, what are your total balances on all other loans and credit cards combined? When did you last miss a loan or credit card payment? How many of your loans and/or credit cards are currently past due? What percent of your total credit card limits do your credit card balances represent? Please indicate if you have ever gone through any of the following negative financial events in the last 10 years: bankruptcy, tax lien, foreclosure, repossession, or account referred to collection agency. Illustration from The Skinny On Credit Cards, published with permission. The Skinny On. This gives you a good idea of what factors determine your credit score. Here is a visual on how your FICO score is calculated from 5 general categories. 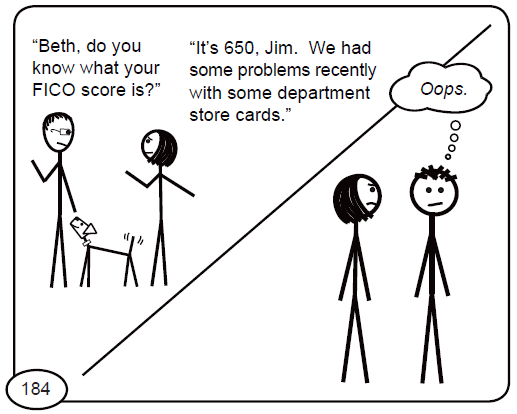 Note: I got the graphic from myFICO’s About FICO scores page. Also, it is a good idea to review your credit report regularly. Since you can get 1 free credit report per year from each of the 3 credit agencies (Equifax, Experian, and TransUnion), you can stack your request 4 months apart and be able to review your credit report year round. Personally, I use AnnualCreditReport.com. Good info but how accurate is it? I used one and if you don’t click reset button, say if you forgot to click 160 day later, it stays the same. The disclaimer takes care of mistakes I guess. In our field, 720 is the normal FICO score which is also the required score to obtain a business loan. But for cash advance they will allow as low 500 FICO. Although you are still correct, 500 FICO is very and sure will need to improved! I am trying to get my credit score up, not good at all right now. I have a foreclosure on there which is not mine, it is actually my ex husbands. Have tried disputing it with the credit agencies but they cannot do anything, needs to be worked out through an attorney. I contacted the divorce attorney who stated they would put in some paperwork and resolve the issue. Well this has been over 3 months and I am at the point of harassment with all the phone calls I make to them, yet nothing has been resolved. What can i do? I don’t understand from where Pinyo u get these information. I m so really impressed with the content formating and your expressive ideas. I just tried the Estimator and it gave me 530-590, which sounds good i believe. My three CRA scores are 450, 520, and 640. Let me be honest to you that I earn minimum wage and have no disposable income I can’t resolve those old debts, so my score isn’t likely to ever get back to normal. what will u advice ?? I also calculated my FICO score from here http://www.creditmagic.org/kno.....oring.html and it is giving me same results. It seems like you have a lot of experiences and stories to tell, have you thought about writing for money? I think you can do ghost writing or something similar and make some money that way. But since I earn minimum wage and have no disposable income I can’t resolve those old debts, so my score isn’t likely to ever get back to normal. I think the delinquent & charged off is A LOT worse than past due account. I think you would have to answer YES to question #10. “I current have no cards, loans, or credit”…do you have any debt? May be it is a good thing given your situation. If a delinquent credit card was closed and charged off, do you count it here as having a credit card and as past due? I have to improve my score, but I have adverse items which won’t go away – not even after 7 or 10 years – and I currently have no cards, loans, or credit. So how am I supposed to raise my score?